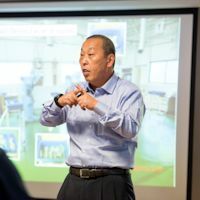 Akinori Hyodo from Toyota’s HiAce manufacturing plant in Japan will lead a two-day Masterclass in Lean Thinking on February 25th and 26th, 2019 in Blenheim. The two-days will provide you with the foundations of Lean Thinking and the links between the Principles and the Leadership behaviours that support them. The Masterclass will include insights and examples used directly within Toyota, and in addition a site visit to WineWorks Marlborough’s facility. WineWorks are industry experts in bottling, labelling, storage and distribution of wine through their highly specialised processes. Their expertise, and experience is coupled with their application of Lean Manufacturing to make it easy to bring solutions to their customers. Hyodo Sensei explains Lean in a way that is profoundly easy to understand and simplifies the approach to Lean Thinking and Continuous Improvement across industry. There are few opportunities to hear from the masters of Lean Thinking so to have one on your doorstep is an opportunity not to be missed. This event is hosted by Simply Lean Business Solutions in association with our Australian partner, Shinka Management. Hyodo Sensei is a long-time Toyota Production System Leader and former Factory Manager and Kaizen Leader. Having retired as a Factory Manager, he now heads the Kaizen Training arm of that same Toyota factory providing Lean training courses for companies in Toyota’s supply chain, and in addition hosts the training component of our annual Lean Japan Tour. The Masterclass will also include an overview of the operations at the Toyota Hiace Factory in Japan, as well as an afternoon tour and mini diagnosis at WineWorks Marlborough. This Masterclass has been developed to cover a range of participants. It details the Lean Thinking foundations from Toyota’s viewpoint so you are hearing first-hand the principles as they were developed by the founders. More advanced practitioners will better understand the links between the applications and the behaviours that bring about Continuous Improvement. Learn first-hand how process improvement is achieved within Japan’s leading companies, and more importantly, how to begin to implement or advance these practices within your organisation. The mix of teachings and the practical process development sessions will satisfy all levels of participants from Managing Directors and Managers in Operations, Production, Continuous Improvement, or Quality, to shop-floor Leaders interested in developing their own knowledge and fostering a culture of Continuous Improvement within their organisation. To Register your Interest in this event click on the Enquire button on the right of this page and fill in your details. Spaces are limited so register now to secure your seat. Simply Lean Business Solutions Limited, Shinka Management and WineWorks reserve the right to decline registrations owing to conflicts of interest. Confirmation of your registration and payment details will be by return email. Those who are eligible for funding support through the Regional Business Partner Voucher Scheme will need to apply for this through their respective local Regional Business Partner.